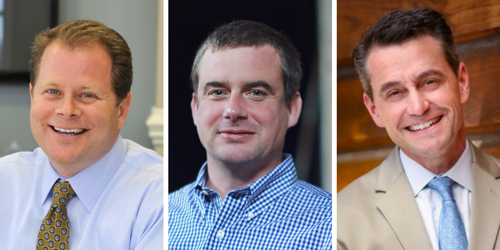 Join us on Friday, April 13, as we present the 2018 Distinguished Alumni Awards to David Ravin ’89 and Charlie Wilson ’89 and recognize Associate Head of School Lee Hark as the recipient of the 2018 Faculty/Staff Legacy Award. The Spring Alumni Reception begins at 6 p.m. in the Upper School Learning Commons. David Ravin and Charlie Wilson, both members of the Class of 1989, will be honored April 13 as recipients of Durham Academy’s Distinguished Alumni Award. Not only are Ravin and Wilson DA classmates; both are involved in commercial development and construction, and both are active community volunteers. Ravin is president and CEO of Northwood Ravin, a real estate development company with offices in Charlotte, Tampa and the Triangle. Northwood Ravin has received national and regional recognition from the National Association of Homebuilders, Urban Land Institute, ICSC, CEL National Customer Service Company and National Multi-Family Housing News. The firm has many projects in the Triangle — including downtown Durham, where Northwood Ravin is developing 555 Mangum, a 10-story office and retail building, as well as a second, mid-rise building with approximately 400 apartment units. Ravin earned a Bachelor of Architecture from UNC-Charlotte, a Master of Architecture from the University of Michigan and a Master of Science in real estate from the Massachusetts Institute of Technology. He serves on the board of trustees of Charlotte’s Providence Day School. Wilson is president of C.T. Wilson Construction Company, a 66-year-old Durham firm that has built and renovated a variety of structures in central and eastern North Carolina, including Revolution Mill in Greensboro; Saxapahaw Rivermill in Saxapahaw; Golden Belt and Venable Center in Durham; and Durham Academy Upper School’s Kirby Gym, Learning Commons and STEM & Humanities Center. Wilson earned a B.S. in civil engineering from N.C. State University and an M.S. in civil engineering from the University of Texas, Austin. He is building division chair for Carolinas Associated General Contractors and a member of the board of trustees of the Carolinas AGC Foundation. He has served as board chair for Housing for New Hope and on the board of trustees for The Forest at Duke, N.C. Museum of Life and Science and Durham Academy, where he was chair of the Buildings and Grounds Committee. Lee Hark has had a tremendous impact in his 10 years at Durham Academy. He has served in a variety of leadership positions at DA, including Upper School director, coordinator of faculty recruitment and Upper School English teacher. During his eight years as Upper School director, he banished bells — convincing students and faculty they would indeed know the beginning and end of class periods, lunch, tutorial, etc. without the aid of an audible signal — and co-starred in DA’s now world-famous “Ice, Ice, Snow Day” viral video announcing a school closing. As associate head of school, he has been the driving force behind the “The DA Graduate: A Mission-Driven Life” project and the faculty’s curriculum-mapping work. Hark is both fun and fundamental and embodies DA’s mission to educate students for a “happy, moral and productive life.” On April 13, he will be honored with DA Alumni Faculty/Staff Legacy Award. DA Alumni Board President Garrett Putman explained that the award recognizes Hark for his extraordinary teaching and love of students; for his leadership as Upper School director and associate head of school; for his ability to connect and stay engaged with alumni over the years; and for being an ambassador for DA at major educational conferences, recruiting events and as an AP English exam reader. Hark will be the seventh recipient of the Alumni Faculty/Staff Legacy Award, joining Dave Gould, who was the award’s initial recipient in 2012, former head of school Ed Costello, former Preschool Director Sheppy Vann, Middle School history teacher and former Middle School Director Tim Dahlgren, Middle School science teacher Barb Kanoy and Upper School math teacher/former varsity cross country and track coach Dennis Cullen.